All My Google Reviews Are 5-Star Reviews. Why Do I Have a 4.7 Overall Rating? We’ve been asked this question more than a few times by ReviewTrackers customers and readers. 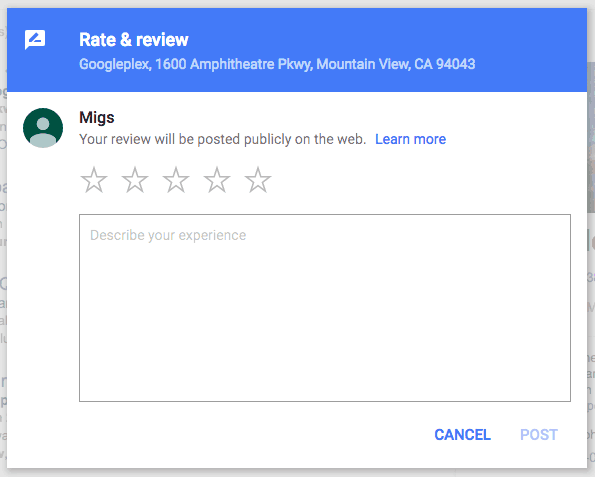 They will have a total of, say, 6 or 7 reviews on Google My Business, with each one having a perfect 5-star rating. But then the overall rating on their page — the rating that appears on Knowledge Panel search results, Maps results, and their actual Google business listing — is less than 5 stars. Sometimes, it’s 4.7, or 4.8, or 4.9, whatever; it’s unexpectedly less than perfect. Industry observers and search experts suggest that Google has its own unique algorithm for calculating overall ratings. Some believe that the search engine giant uses the Bayesian method for averaging, which means that, in situations where you have a limited sample size with only 6 or 7 reviews, Google’s algorithm is designed to extrapolate or estimate what your overall rating might look like if you had more reviews. So if your 5-star reviews are less than a certain number, Google is probably not going to calculate your rating in the straightforward way you expect them to. Why would they even do that, you ask? Well, if you come to think about it, there’s a potential issue when Google calculates average ratings the traditional way — an issue that could affect how consumers use search results and discover businesses. If a business has 6 perfect 5-star reviews, it shouldn’t necessarily rank higher or have a better rating than a business that has collected, say, 98 5-star reviews and a couple of 3-star reviews. For one, the latter is more prominent (to use a Googly term, given that the search engine considers online and offline “prominence” as a key factor in search rankings), and therefore its overall rating or score will probably take into account review quantity as a signal in order to best reflect the quality of the establishment. On the other hand, the former’s sample size of 6 reviews isn’t big, making it likely that Google’s algorithm would automatically factor in for error until that business gets more reviews. If review quantity is just one of “a variety of signals,” what are the others? 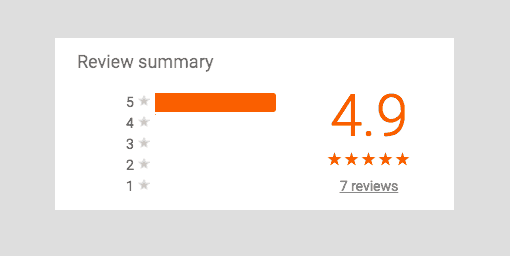 And is there an exact number of reviews where Google draws the line between “We’ll weigh this small number of 5-star ratings differently” and “The sample size is big enough”? We can only really speculate — until Google decides to explain in greater detail how they do the math. It doesn’t mean that there isn’t anything you can do as a business owner. And don’t be too disheartened by the presence of a lower overall rating than your perfect 5-star reviews have led you to expect. Hopefully, in time, your brand presence on Google could more accurately reflect the 5-star customer experiences your business strives to provide. More and better reviews on Google not only help improve your search ranking; they also help you get an overall rating that stays true to the ratings of existing reviews you already have, instead of being dependent on Google’s estimates and predictions). If you don’t yet have one, develop a strategy for encouraging reviews and collecting feedback from your happy customers, who may already be poised to give you 5 stars and up your rating. Sometimes, all they need is a little nudge. (Also, if you think your review page may be missing some reviews, see our guide “My Google Reviews Disappeared“). Not everyone has the time or resources to execute full-fledged review campaigns or NPS-based surveys. But if you have 2 minutes, you can already come up with at least one way to generate more reviews: by creating a link that customers can click on to leave a review of your business on Google. You can share the link on a website page, across your social media profiles, in e-mails to customers, and even offline (think receipts or feedback cards). Go to Google Places API. Type your business name and information in the “Enter a location” box at the top of the map, then click your business in the list of search results that appear. Your Google Place ID will appear on the map. Copy this ID and add it to the URL: http://search.google.com/local/writereview?placeid=<place_id>. We know it can be hair-pullingly annoying. But if your perfect 5-star reviews on Google have somehow produced a 4.8 or 4.9 overall rating, it’s not really something you should be worried about. Your score will improve sooner or later. So focus your efforts instead on digging deeper into your existing reviews. Read the actual text. What are your customers telling you in their own words? Have you noticed any common issues or trends in your reviews? What, specifically, did they love so much about your business that they decided to rate you with 5 stars? By going beyond ratings and looking more carefully into feedback, you can achieve a better understanding of your customers and their experiences. Questions? Send us a message or leave a comment in the section below. Hi, i would like to be able to create a report showing total number of Google reviews, per month, per location. Is that possible ? My company MY MD Urgent Care has 85 five star reviews, and 3 one star reviews (of which 2 were fake, and reported to Google as such by disgruntled ex-employees – we are an urgent care, and maintain a 3rd party EMR for patient records, and as such these 2 reviewers were not in our database, but they coincided with an employee termination). We currently have a 4.9 rating, and don’t understand why we can’t seem to get the elusive five star rating. thoughts?